The ‘tome’, or ‘countercultural bible’, as the book was sometimes called, spawned out of a strange and fascinating turn of events which spearheaded the hippie movement. The fateful story began in the early 1960s, when Harvard psychiatrists Timothy Leary and Richard Alpert began experimenting with hallucinogenic drugs – psilocybin mushrooms, and then later LSD. Each of the Harvard professors had supremely profound experiences, which seemed to laugh off all the years of intense academic study they had accumulated in becoming psychiatrists; they saw in their experiences with the drugs, a possible cure for the neurotic individual who may or may not go to see such psychiatrists – that cure was LSD. 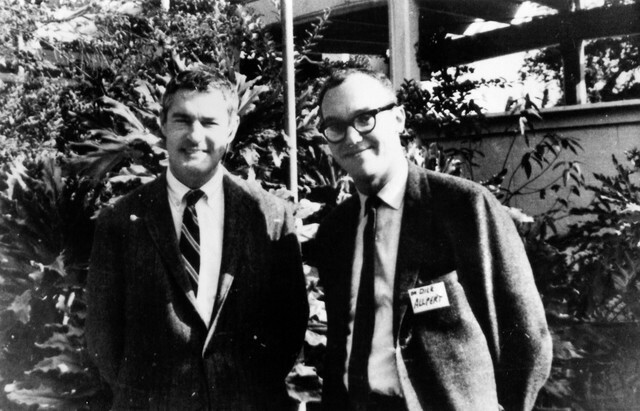 LSD was still legal at the time, and so Timothy Leary and Richard Alpert began exploring the uses of the drug in a safe and therapeutic environment; the majority of research on the drug’s possible uses in psychology was done in this small window of history. In 1963 new laws imposed restrictions on medical research on LSD, and Richard and Leary were both expelled from the university for giving out psilocybin mushrooms to students. In 1964 Leary and Alpert collaborated on a book called The Psychedelic Experience, which was meant as a guide for those using psychedelic drugs without the presence of a practiced psychiatrist. 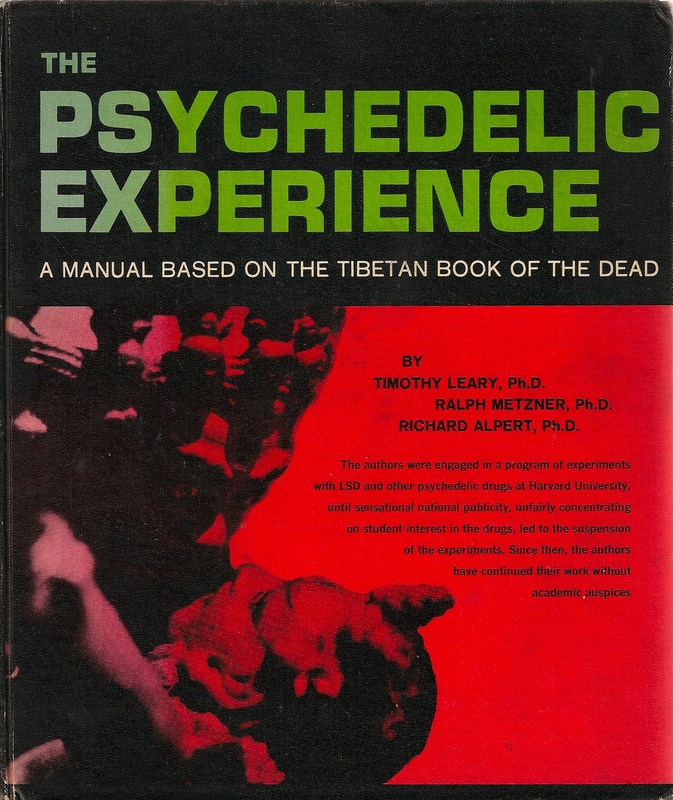 The Psychedelic Experience was based on the Tibetan Book of the Dead, which was an ancient Buddhist text read to recently deceased to help guide the passing of their spirit to it’s next reincarnation. Similarly, Leary and Alpert’s book was intended to guide the reader through a psychedelic session, and to help the process of detaching from their ego, thus realising their ‘true’ self, which remained dormant and untouched by social conditioning. Therefore, in contrast to the Tibetan text, Leary and Alpert’s book prepared the user for a spiritual ‘death and rebirth’ rather than a physical one. Shortly after, Timothy Leary and Richard Alpert set up a large mansion in New York to conduct more experiments on LSD and psychotherapy, away from the watchful eye of new law. Eventually all scientific emphasis was abandoned and the house became a place to get stoned and throw LSD parties. Leary moved on to become a psychedelic ‘guru’ of the hippie movement, and coined the hugely misinterpreted phrase ‘turn on, tune in, drop out’, while Alpert, in the thrust of his thrown away career, left for India in 1967. A year before LSD was completely outlawed in America and classified as a Schedule I drug without any “currently accepted medical use in treatment”, despite the abundance of research which suggested otherwise. Below is a fascinating interview with Richard Alpert on the use of psychedelic drugs, which demonstrates how the drugs loosened his ‘academic’ image of self and served as a catalyst for his later metamorphosis into Ram Dass. 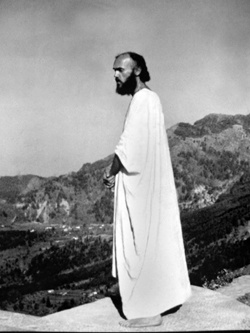 It was in India when a revolving door of concepts and stereotypes – a white, neurotic, closet homosexual, Jewish, success hungry, Harvard psychiatrist, traveled to India and had a spiritual transformation at the foot of his newly found guru, Neem Karoli Baba (Maharaji). With the help of his guru, Richard Alpert attempted to shake of his socially forged concepts like a dog shakes off water, and eventually he became yet another busy palette of concepts – an enlightened Hindu yogi, living in the spiritual world, and a white, American born one at that. He had swapped one role for another – psychiatrist for mystic, one could even point out many similarities between the two. But the analytical mind which usually defined such concepts and pondered any similarities withered away in Richard Alpert, and in it’s place developed a ‘here and now-ness’ – a total sacrifice to living in the present moment as opposed to the past and future. With this new found perspective, Richard Alpert began a shedding process of his ego, much like the snake sheds it’s skin. 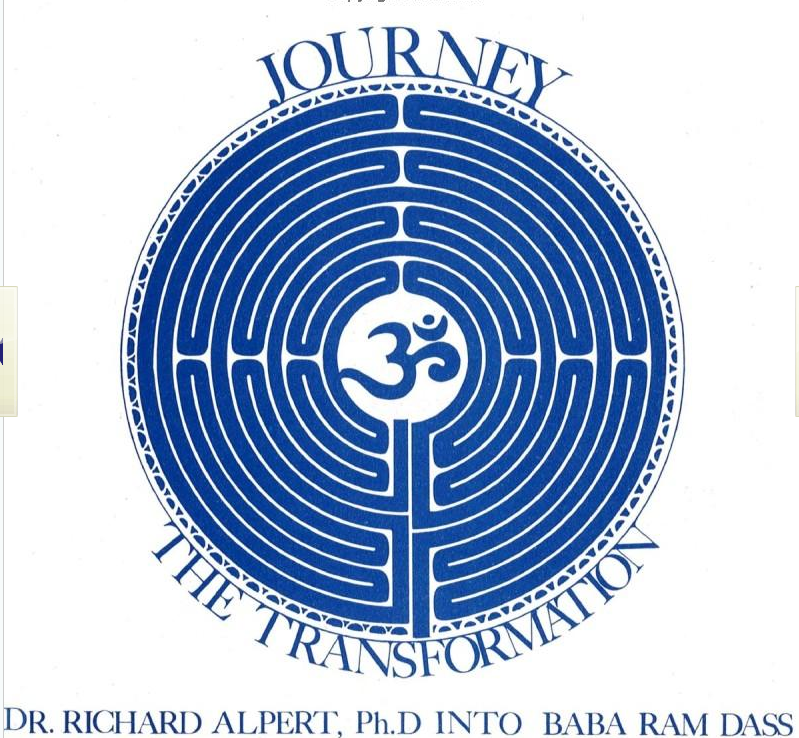 It was at this point when Maharaji renamed Richard Alpert as Ram Dass, which translates in English as servant of God. You can see the 4 sections from the side view picture below. Mandala of the ancient Buddhist temple Borobudur in Central Java, Indonesia. The second section is the largest, strangest, most memorable, the reason you buy the book, and the reason you don’t lose it. This is the ‘core’ of the book, and it is the most unique thing I have ever come across. The text and drawings are all printed on brown kraft paper, which gives the book the illusion of a secret tome printed on thin slices of wood. Be Here Now’s pages are dripping with character, it’s simple message jumps out of every page in full dimension. The pages in this section don’t read top to bottom but left to right, and so it is held and read like a scroll, as often the text and illustrations sprawl over both pages. I remember first learning of the book’s existence maybe ten years ago, through a small online community who collectively knew more about the worlds contents than I ever could at such a young age; these people spoke very highly of the book and had passed around a pdf version of ‘the core’ section – everyone said you must be high on LSD to ‘get it’. I was very young and I don’t pretend to understand a word it said at the time, I simply admired the pictures and rejoiced at the vivid imagination I was witnessing. Years later I learnt who Ram Dass was, and the origins of the book, and after finally securing my own physical copy of the book I read the entire thing, slowly absorbing every page, in one sitting. You don’t have to be on LSD to ‘get’ this book, or to even enjoy it; a basic understanding of Hinduism, Buddhism, Christianity, and an open mind will take you much farther with this book than any psychedelic drug will. If you have all of these, thenmaybe a light dose of mushrooms can be a treat, but keep the dose small as you certainly don’t want to read this book zapped on drugs! Of course, Ram Dass then writes about each of these things in glorious detail, and even sprinkles in the pan a nice helping of ‘potent’ quotes which aid the process of spiritual awakening; these quotes are added after each section and are relevant to what was said in it’s pages. This ‘cookbook’ is easily worth the cost of the book and I would not hesitate for a second to recommend buying Be Here Now just for this section – while the previous art filled part of the book is the most memorable, this is definitely the most worthwhile. You must be thinking there is a catch, as a book this overflowing with usefulness can’t have a price tag of $10! The reason it is so cheap is that it’s purpose was never to make a profit, and so yet, it really is a steal. Treat it as a gift, as the price is just to cover the costs of distribution and help support the foundation which started it. 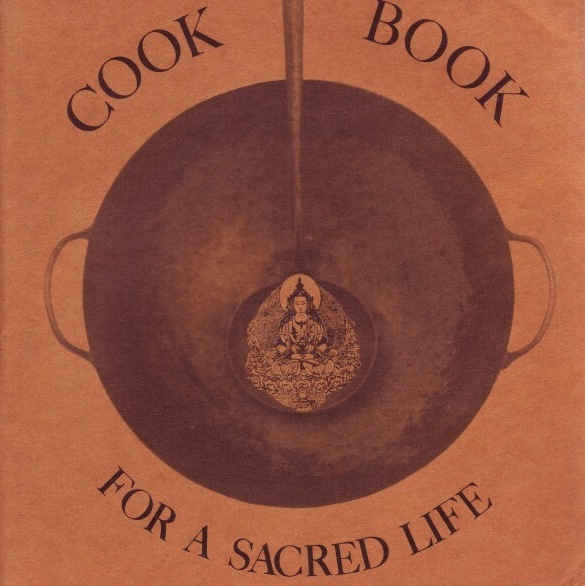 The cookbook is designed for someone who has read the From Bindu to Ojas section, and either wants to understand it’s symbolism a little better, or simply wants to get on with it and start meditating. Be Here Now clearly doesn’t leave anyone out, this section is packed full of useful mantras, yoga asanas, pranayama breathing excercises, and general advice to help you get on your way – it even covers basic things such as sleep and eating. Finally the book ends with a section called ‘Painted Cakes Do Not Satisfy Hunger’, which is a lengthy list of books that Ram Dass recommends for those on a spiritual journey (the list isn’t exclusively focused on spiritual books and even includes works of fiction he enjoyed such as ‘Brave New World’ by Aldous Huxley). The title of this section implies that reading books won’t satisfy the soul and cannot replace real practice; but since books act as sign posts on the path of spiritual development, the section is included. The list of books are broken up humorously in sections such as ‘Books to Hang Out With’ and ‘Books It’s Useful to Have Met’. Be Here Now didn’t start off as the paperback I am reviewing, but actually began as a box set which contained all 4 sections of Be Here Now as a separate work, as well as a booklet of spiritual quotes, and a few photographs of spiritual masters. 900 of these box sets were produced and they were shipped free of charge to those who requested it. 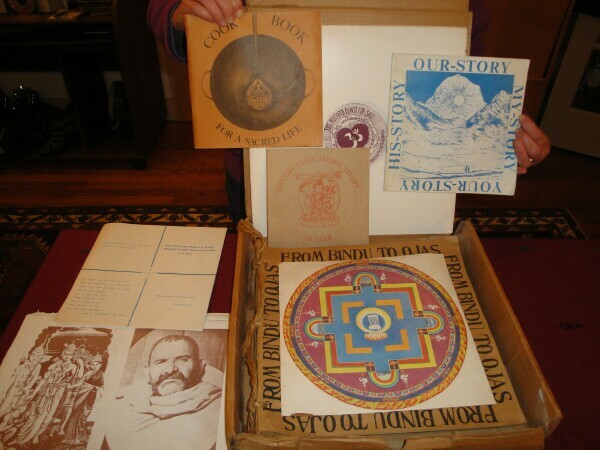 The core book was titled ‘From Bindu to Ojas’ and was printed on sheets of cardboard and bound with string; due to the huge effort involved in producing and shipping these box sets, the collection was condensed into paperback form in order to spread Ram Dass’ teachings to a wider audience. 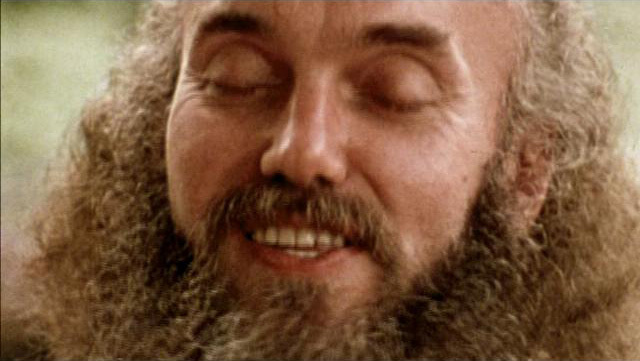 Ram Dass submitted the book to nine publishers who all rejected it on the grounds of it appearing to promote psychedelic drugs. 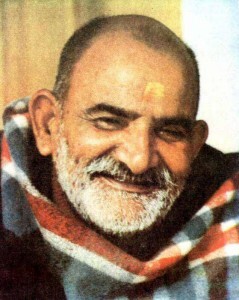 Speaking of his guru Maharaji, Ram Dass said, “I said to myself, ‘If this guy is who I think he is, he is the publishers and he can’t be turning down his own book.’” The paperback was finally accepted and only a few thousand copies were printed; neither Ram Dass or the publishers knew how popular the book would become. 2010 marked the 40th year anniversary of Be Here Now, and the book continues to inspire and fascinate. From Bindu to Ojas box set – Be Here Now’s original manifestation. 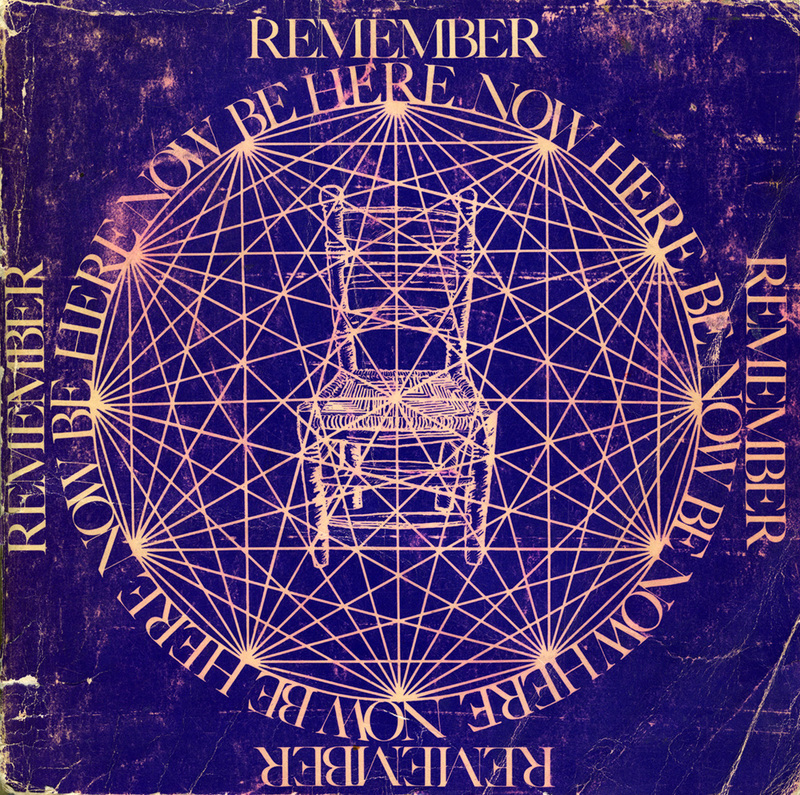 If you are reading this far then I can only assume you are still interested in how this strange book came about, so here is an excerpt from a 4 hour lecture Ram Dass did to a room full of psychotherapists at the Menninger Foundation in 1970, in the excerpt, Ram Dass details how the book ‘Be Here Now’ came to be. The entire lecture transcription was published in the Journal of Transpersonal Psychology in 1970, and also as the book The Only Dance There Is in 1974. “The book came about in a very strange way. I was in the temple in India and I was with my guru and a lot of remarkable things had been happening to me there and I kept some notes in a little book. 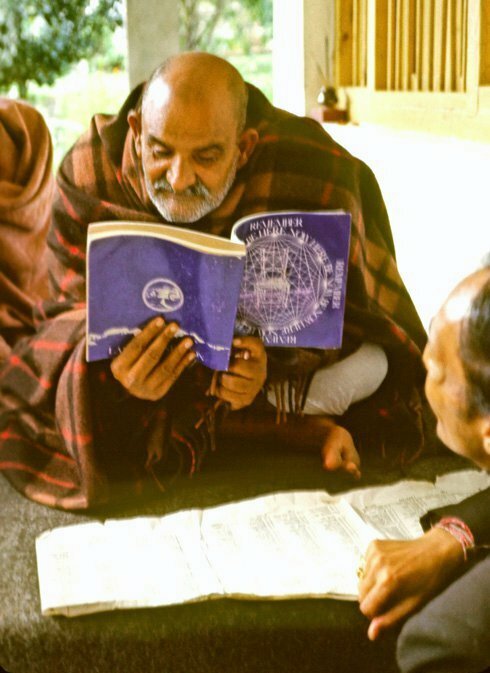 One day the teacher came to me and he said, “Maharaji,” meaning my guru, “sent his blessings for your book.” So I said, “Well, what book is that?” and he wrote “Whatever book it is you’re doing.” So I thought, “Well, obviously I’m supposed to do a book,” because you don’t get any better instructions than that, in that scene. They don’t say, “Now go out and…,” you know, “Do that, team.” It’s not that way. You just do whatever it is you’re supposed to do. So I figured I’m supposed to do a book. So I thought, that isn’t the book. So I let it sort of hang for a year or so. And then people started to gather and I started to do this talking for a couple of years, at no charge, because I was no book, I was just doing it when people would drop by. I was going to sit in my cabin for a whole year and then go back to India. That was my original plan, since nobody told me I was supposed to do anything. And I realized that any game I do comes out of my own ego. My job was just to work on myself, and if anything happens, it happens. Well, my impurity became very apparent to me. It was an exquisite impurity, the way all this happened. I was living in this little town of Franklin, and I went to the grocery store. My father was up for the weekend, and he said to me, “Take my new Cadillac.” So I got into his new his new Cadillac, which of course blew my mind, you know, Sadhu renunciate driving a new Cadillac. I thought, “The boys in India should see me now!” And I am driving into town and I see two hippies over on the side of the road, a couple, and I wave at them and they at me. I go into the grocery store and I come out and there are five or six of them standing there. One of them comes over to me and he says, “Hey, man, you got any acid?” And I thought, “Oh-oh, I’ve been found out, who I’m supposed to be, you know; my history’s caught up with me… my karma, I can’t change, you know. They see I’m Richard Alpert, notorious drug man.” So I said, “No, why do you ask?” They said, “Well, we heard a connection was coming up from Boston today and we saw this big Cadillac with masked plates and this guy with a beard and we figured you must be him.” So I said, “Well”… see now, here is my impurity, the next line is the statement of my own impurity. All I had to say at that point was, “Well, I’m not him. See ya,” and get in the car and drive back into my woods. But, the other line I used – which was my own desires, which is why we’re here tonight – is the line, “Gee, I’m sorry, I’m not that kind of connection.” That’s a leading line like, “Come on, baby, don’t you want to know what kind of connection I am? I sure look interesting, don’t I?” So, of course, I’m asked, “Well, what kind of a connection are you?” and so on, and that leads to them dropping by and then them bringing up their friends, and their friends bring their parents, and the parents bring the minister, and the newspapers, and then the universities. Wherever I was asked, I went. So it was the Rotary Club and Borscht Belt hotels and universities and hippie hangouts and communes. And I shared whatever I was supposed to do. So all of these started to be taped. It’s a big generation of collecting stuff, so people would collect tapes. And then this groovy woman, you know, typed them all up, till it was a stack, a huge stack of these tapes from everywhere. Then this writer, John Bleibtreu, on the West Coast, was reading through them, and he said, “You know, there’s really two beings in these tapes. When you start out one of these tapes usually you’re being very professory, you’re talking heavy, you’re teaching but when the audience is a certain way and they let it happen to you, it’s as if you disappear and something starts to happen so all the words come out sort of like in iambic pentameter. They’re not like you’re talking at all, it’s just like there’s beautiful stuff coming out, except it’s all 1970ish stuff. It’s a lot like the Book of Tao, but it’s sort of ’70ish.” So we said, “Well, why don’t we cut out all the heavy parts and we’ll put that together.” Since I didn’t say it, you see it isn’t me saying it, maybe this is his book. He’s writing his own book. He doesn’t trust me, he doesn’t want my heavy mind writing his book, he’s going to write his own book. So we started to put all this stuff together, and we got a book. There’s a group in New Mexico and, as I said last night, they start with these four-foot pieces of cardboard and this book is 108 pages and each day they meditate from five to eight in the morning – there’s a group of five of them – and then all in silence… they hand rubber-stamp each page, all the letters of the page, and then the artists do all the sketching around the thing. Then the whole thing is photo-reduced and shipped to Japan where it’s printed on rice paper and hand stitched because it’s an experiential-type document. So that was the basis of the book and I was going to do 1,000 of those and split. That was my deal with Maharaji. And then people said, “Well, if you’re going to do it would you include that long bibliography on mysticism that you’ve been working on?” So, “O.K, I’ll put that in.” Then somebody else said, “You’ve got all these quotes you read all the time from Buddha and so on. Would you put those in, like little cards we can hang up, cards you can put up on the screen door as you’re going out – ‘The journey of a thousand miles begins with a single step,’ by Chuang Tsu. And you’ve got one for over the toilet and one for going to bed and one for over the refrigerator.” So we thought we’d put in a deck of those. Then somebody said, “You know, you’ve got all these pictures of these high beings and you hang out with them. Why can’t we hang out with them? Could you put in a set of them, put in two sets so if we take them out we won’t ruin the book.” “O.K. We’ll put those in two.” And then somebody else said, “Say, you know that long fancy book, my parents aren’t going to understand it, you know. Could you do something very straight, like for my parole officer or my parents or whoever…?” “O.K., we’ll do a nice straight journey-to-India type story. Just tell the facts of the whole matter and…” So we put that in. And then somebody else said, “You know, you’ve been talking about diets and about asanas and about breathing and you’ve been teaching this stuff about how to live and how to… what kind of world you start to create to change consciousness. Couldn’t you put in sort of like a cookbook-type thing for people who say, ‘All right, I want to do it, now what do I do?’ for doers?” So we’ve got a psychic cookbook in there, too. A do-it-yourself enlightenment kit. And then people said, “You know, you chant, and I’ve been chanting with this girl and she plays the dulcimer and I play the tamboura and we just go out together on these far-out chants, Indian chants. Could you put in one of those throw-away records like Look or Life puts out, those little cheap records? Well, that turned into a twelve-inch record on both sides. So that’s in there. So it became a box instead of a book. And the box had a big mandala on the front of it, and the box is called From Bindu to Ojas. Bindu is sexual energy and Ojas is spiritual energy, and it’s the transformation of energy within the body through the conversion of a form of energy. It’s called the raising of the Kundalini, is one way of talking about it. Yes, all of the above (not including the record obviously) is somehow compacted and included into the paperback Be Here Now. It is a book that keeps on giving! I hope you have enjoyed this trip through history lane, and if you do decide to get yourself a copy of Be Here Now to sink your teeth into, hold onto it and never let go! Also, be sure to check out my review of Bhagavan Das’ autobiography, ‘It’s Here Now (Are You? )’ which is a great companion piece to Be Here Now! This entry was posted in book review, buddhism, game over, hinduism, non-fiction, religion, spirituality, writing and tagged be here now, book review, hinduism, meditation, ram dass, spirituality by Michael Cunningham. Bookmark the permalink. I was suggested this web site by my cousin. I am now not sure whether this publish is written via him as nobody else know such exact about my difficulty. I found Maharaj ji a few years ago, or He found me… and ever since my life has not been the same! Pingback: Los 61 libros que recomiendan Gates, Jobs, Bezos, Marisa Meyer y los líderes de las principales tecnológicas del mundo | Android 3G - ¡Estamos conectados con la Tecnología Android!. Pingback: Los 61 libros que recomiendan Gates, Jobs, Bezos, Marisa Meyer y los líderes de las principales tecnológicas del mundo | Galaxy Androids: Todo para tu SmartPhone con Android.